As the title of the book suggests these are five verses, believed to have been composed by Adi Shankaraachaarya, in which the great world teacher introduces all genuinely- interested students to the rudimentaries of the spiritual science of Vedanta. Just like any empirical science, this Vedantic science is also a very highly developed science desiderating a great deal of steadfast dedication and burning enthusiasm on the part of the seekers. In the first verse the conglomeration of the body, the senses, the mind etc. is taught to be 'Anaatman , or not the real Self. In the next three verses, viz. 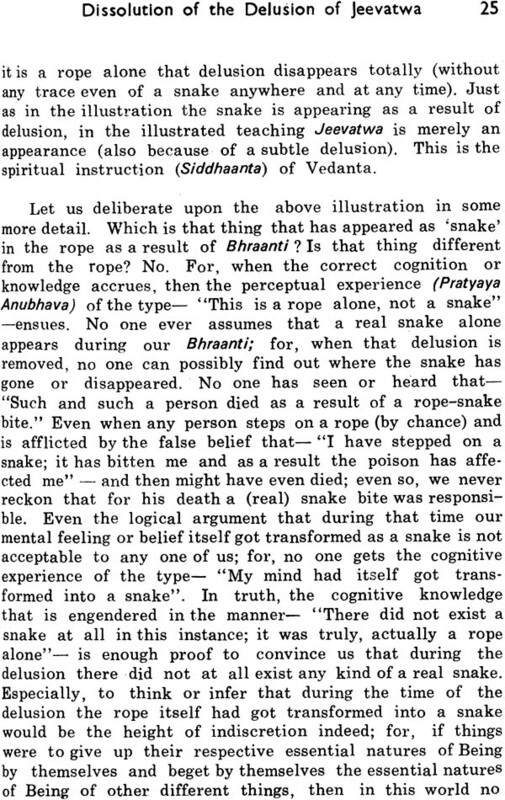 2nd, 3rd and 4th, delineating with the help of three illustrations of the rope-snake, the dream, the reflection in a mirror, Shri Shankara brings home to our minds the salient teaching of Vedanta that- "Although, in the ultimate analysis, we are not really or absolutely transmigratory souls (Samsaaris), due to Bhraanti or delusion we are falsely appearing to be enjoying the transient pairs of opposites like Sukha (happiness) and Duhkha (misery) as also to be totally different from Parameshwara, the Lord Creator. In the last and fifth verse it is expounded that our core of Being in its essence per se is Chaitanya, which is perennially free, liberated, pure and perfect, devoid of any blemishes or sins whatsoever; consummate, all-pervading, all-consuming Reality. It will become quite evident here that Shiva means not one of the members of the mythological Trinity-Brahma, Vishnu, Maheshwara-but the Ultimate non-dual Reality which is beyond the three states of waking, dream and deep sleep, also called Paramaatman, Parabrahman, who is the innermost Self of all of us. This booklet will, it is hoped ardently by the publishers, engender an abiding interest in the unique methodology of teaching such a terse, subtle, metaphysical science which concerns our life taken in its entirety. If it whets the appetite of the casual reader, he will surely take to studying the other texts meant for genuine seekers of Moaksha or Liberation, Beatitude. A detailed commentary is given with this objective alone. Although Vedanta is a Shaastra or scientific text which, without mentioning the fruits that accrue to the devotees in the other worlds of the celestial region, delineates the 'Anubhava' or Intuitive experience that can be attained here and now in this very lifetime, the majority of the common run of people do not show any mental inclination" towards this spiritual science. The reason for this is: For many people, in general, texts which demand or desiderate a predominant sense of discrimination ratiocination on the part of the reader or student do not attract their minds; even among those whose minds have been induced to take up the study of these texts and to deliberate upon the topics and teachings propounded in them, many have not understood thoroughly as to which are those topics or phenomena that are of prime importance and which are those subordinate topics helpful in discerning and developing the former. Because of the reason that those who do not possess any basic inclination or propensity for discrimination are not at all the qualified persons for Vedanta, their case is not relevant for us here in this context. 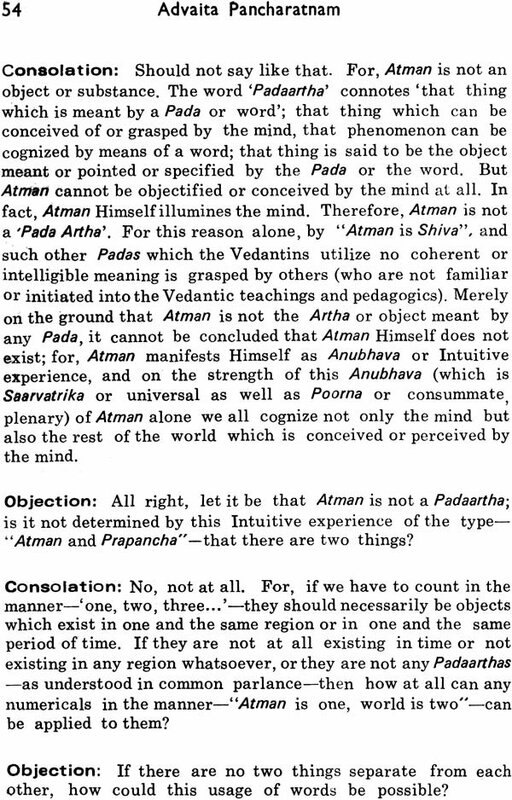 But it is quite evident that for the sake of those who are sincerely and dedicatedly aspiring to cognize the Ultimate Reality of Vedanta so as to match it with his/her Intuitive experience here and now a primary treatise which selects judiciously the most important, cardinal teachings of Advaita Vedanta and expounds them in a lucid manner becomes a necessity. With a view to meeting this dire need of those who are exposed to this spiritual science for the first time in their present materialistic extroverted way of life, Shri Shankara Bhagavatpaada com- posed these pithy five verses of Advaita Pancharatnam to cover a whole theme of the spiritual science par excellence of Vedanta. This small treatise, in fact, unravels its teachings in the form of a compact commentary. The principal tenets of Vedanta are three: (a) The Absolute Ultimate Reality, without anything else whatsoever as second to it, is Brahman alone; (b) in It both Jeevatwa or soulhood and Jagat or the physical universe of manifold diversity are misconceived; (c) The Absolute Reality of Brahman is, in truth, our Atman or innermost Self (beyond our 'I' notion). All these three tenets have been explained here in this text by way of a commentary for the benefit of the genuine seekers. The knowledgeable seers or sages aver that if an initiate to this spiritual science wishes to know or cognize these tenets SO as to realize them in his own Intuitive experience, four human excellences have necessarily to be acquired by assiduous practice. These spiritual practices called "Saadhana Chatushtaya"- also referred to as "Saadhana Sampat" - are the following four: (i) Nityaanitya Viveka; (ii) Iha Amutra Phala Bhoaga V;raagaha; (iii) Shama Damaadi Shatka Sampat; (iv) Mumukshutwa. Nitya-Anitya Viveka:The capacity to cogitate and contrast what is eternal and what is non-eternal is called by this phrase. The practitioner should deliberate upon the quest- ions: What is the essential nature of any thing or phenomenon which is Anitya, meaning those objects which are within the purview of time? What is the essential nature of Nitya Vastu, meaning an entity which, if it exists at all, is beyond time? Iha Amutra Phala Bhoaga Viragaha: The absence of any hankering after the enjoyment of such and such a pleasure in this world (Iha), as also the enjoyment of such and such a happiness in 'Paraloeka: or other celestial worlds mentioned in the scriptures and mythological texts (Amutra) is called by this phrase. Viraaga or Virakti means detachment, renunciation. 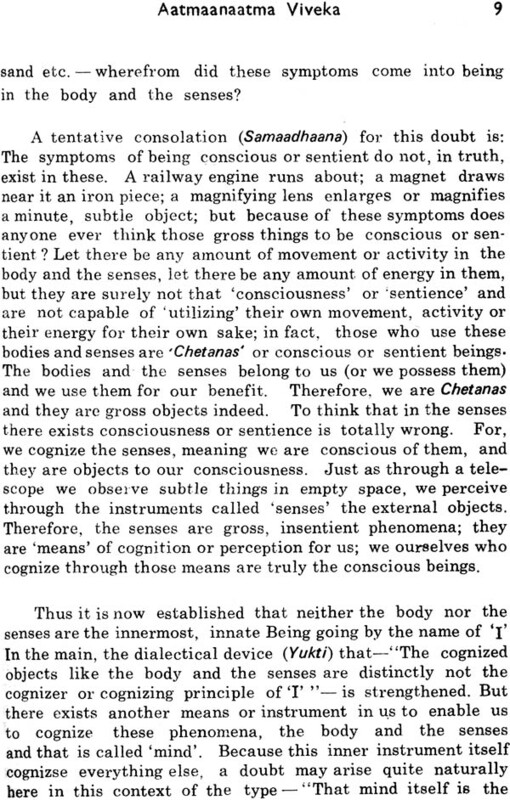 It is to be realized that one whose mind is engrossed inessacntly thinking about the sensual objects outside and thereby is always extroverted, will find his mind wavering and wandering out amidst the multiplicity of external objects and hence it will not be available for him to concentrate and converge on the meta- physical, transcendental Reality (Paramaartha) of Vedanta. Hence this Viraaga becomes quite essential for the discriminative seekers. Shama-Damaadi Shatka Sampat: Further, there are six (Shatks) qualities or excellences which should per force be there in the minds of the Jignaasus or people who seek this Knowledge of the Ultimate Reality of Brahman or Atman. They are: (i) Shama or control over one's mind; (i i) Dama or control over one's senses (iii) Uparati or introvertedness; (iv) Titeeksha or forbearance in the face of the pairs of opposites like happiness and misery, heat and cold etc; (v) Shraddha or one-pointed dedication; (vi) Samaadhaana or equipoise of the mind. Note that these six excellent qualities are called 'Sampat' or his wealth. Evidently, the seeker whose mind is endowed with these six excellences or virtues will be mature with the necessary Samskaares' or refinement of mind or heart, enabling him to carry out the subtle. Intuitive deliberation demanded of him by this spiritual science, Mumukshutwa: In addition to these above three qualifications this basic proclivity of the mind is necessary. The persistent persevering quest in the manner - "The present state in which we are is surely not the one endowed with eternal, absolute bliss; such a blissful state which is superior to anything else in this whole universe is plausible to be attained by Man; I have heard about this assurance being given and its veracity being vouched for by the scriptures and sages"•- is itself 'Mumukshutwe', In fact, only those whose minds have imbibed or have been imbued with, this Mumukshutwa will invariably deliberate upon questions of the type-"Which is such a magnificent state of Bliss? What should I do to attain it?" 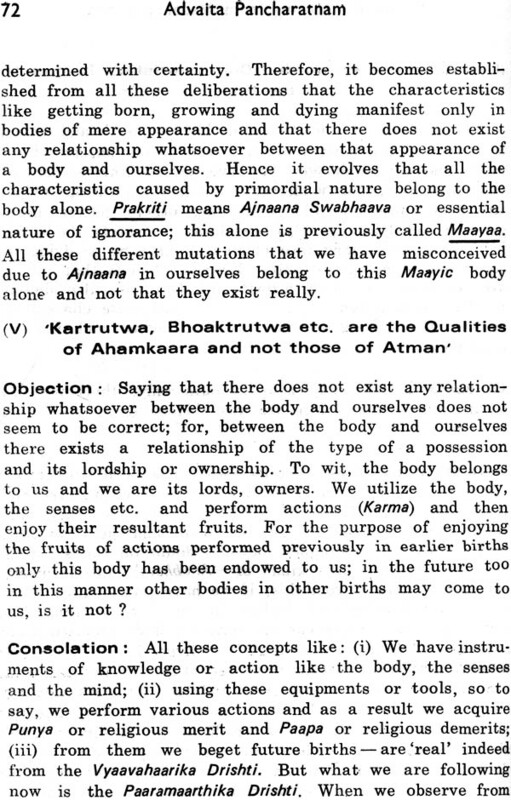 When such Mumukshus listen to the scriptural instruction of the type -"The Absolute, Ultimate Reality is Itself the fountainhead of that Bliss; in fact, that is my Atman or innermost essence as the Self alone" - they go into rapture, ecstasy. Without the least conceit or cunning these people are engrossed in the Intuitive deliberation on the Transcendental Reality of Brahman, Atman; they assiduously endeavour to acquire all the necessary qualities like Viveka and Viraaga etc. for such deliberation. In any case, before one undertakes this Intuitive deliberation on the Ultimate Reality of Atman he should be per force endowed with these four excellences or virtues. Only such seekers will meet with success and their deliberations reach their fruition. Shri Shankara has not mentioned this Saadhene Chatushtaya' in these verses for these are not Seedhanapradhaana' or practical in their import and perspective. They are, on the other hand, 'Siddhanapradhaana or scientific and rational in their approach and treatment of the subject-matter. The first component of 'Saadhana Chatushtaya' which the practitioners or seekers of Beatitude (Moaksha) have to acquire, namely, Nitya-Anitya Viveka or deliberation on the prime questions of 'which is eternal' and 'which is non-eternal' has been exhaustively and exclusively taken up for deliberation here.